Id like to thank Mike Richardson from Durham Council for giving the club the opportunity to ride 2 parade laps of the Pearl Izumi course in Durham City last night, it was fantastic. 13 Members (15% of the clubs current membership) of the club made the considerable effort to gather at 4.30pm on a workday ahead of a scheduled 5pm start to our 2 parade laps around the circuit used later in the evening by the professional racers. All resplendent in the DCV kit it was an honour to ride with them. I feel we would have had more turn out had it not been for a suspect weather forecast which had a high chance of meaning we would not be able to ride the course at all. We also lost a couple of people due to them not being able to get away from work on time. As you can see from the smiles on the faces of the riders the laps where massively enjoyed. We split up a bit as the differing levels of ability in climbing South Street showed but that didn’t detract from the enjoyment and most importantly all riders were safe and enjoying them selves. 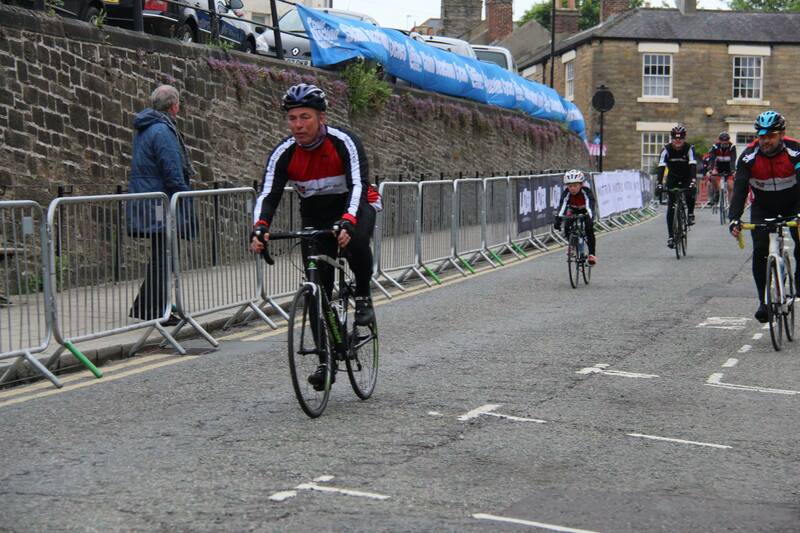 It was great to have senior riders holding back to encourage the youngest of our group, Oran aged 8 up the punishing cobbles. Once we had ridden the laps we all head to the Angel Inn (some via a visit home to get warmer clothes on a cold May evening) to meet up an enjoy the evening racing. Andy at the Angel was a fantastic host and the spot outside was a great one – the ability to watch the race, chat to others and have a pint was fantastic. Added to this was the ability to get take out food from the Elm tree over the road – I had a fantastic Burger and sweet potato fries made it a brilliant spot. Massive thanks to Andy and his staff for the brilliant facilities. Unfortunately we didn’t get the gazebo we had hope to loan to have a branded stand outside but we will remedy this next year hopefully by having our own. All in all for a club just over a year old it was a great event to get our name out there and have fun at the same time. Right what’s the next event to organise…….. This entry was posted in Events on June 1, 2016 by admin.